Jorge Luis Borges once claimed that dreaming was the oldest aesthetic activity which ever existed. That is the first lesson any creative person actually learns, or (at the very least) the one he ratifies when he intends to tell his own stories, and set down an imaginary rhythm that could move as many people as possible. The beauty that is veiled from perception by the tedium of routine and by these memories that sorely search for oblivion becomes visible only in these lands we dream on. The world of dreams is the world of creativity in its most crystalline expression. And you know what? Immersing yourself in such a world is not that difficult. What’s difficult is bringing out what you manage to find there, and having it applied to reality in a way that retains its charm intact, and that doesn’t leave you uneasy, looking at your hands as if trying to remember what you could create with them whilst you were dreaming. “Volver Al Futuro” [Back To The Future] is the first album by Les Enfants, and it manages to showcase what happens when both worlds become perfectly interconnected. “Volver Al Futuro” is the stage in which dreams and reality become all and one. 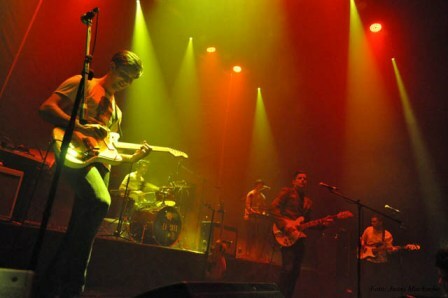 The band was started in 2008, and its five members decided to pick a French moniker since they reasoned a name in French would be more memorable in a scene where English names are legion. But they also went for one such name because they still see themselves as children in many senses, specially when it comes to all ludic activities. 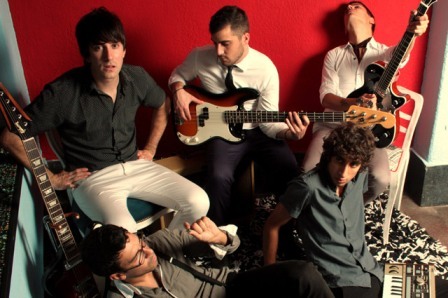 In essence, Les Enfants are a rock-pop band which uses synthesizers to enrich their music. It’s evident that bands such as Primal Scream, The Killers, The Smiths and The Flaming Lips have been a great influence on their sound. And so have been a handful of South American bands such as Soda Estéreo and Virus. Martín Vallejo acts as the band’s vocalist, and the songs are created collectively. Martín brings his different drafts to each and every rehearsal, and they all work together to shape both the lyrics and the music. Martín is likewise one of the two guitar players in the band, along with Mauro Bolatino. Roberto Suárez handles all keyboards and synths, whereas the band’s rhythmic section is made up of Javier Gorgoso on drums, and Rodrigo González on bass. The aesthetic sense of the lyrics is what shines through more strongly. Frankly, it’s something quite amazing. There is a strange symbiosis. We know these things Martin is going to say when he begins speaking, but he says them in such a way that the end result is equally compelling. And we end up thinking about his lyrics like someone who is writing a letter, and who tilts his head to one side in order to make sense of his feelings and finish it off. And Martín’s voice is incredibly ductile – the way in which he sings his songs is comparable to the way in which a joyous person laughs. “Volver Al Futuro” speaks of emotions that explode when verses are rubbed, of being able to show the best of us to the people who deserve it (and who have been longing for it), of sparkling in the mist… the voice we hear throughout the album is one that brings every single emotion to life. And the music validates everything, as if the notes were steps which legitimate the path they are following in themselves. And the degree of conceptualization at play is also praiseworthy. It will have these listeners who play albums from start to finish enchanted. The desire to transcend and shine (as expressed on “Estrellas” [Stars], the album’s masterpiece) is what comes first. And the last song (“El Sueño Es Hoy” [The Dream Is Today]) analyzes the importance of learning to implement all these dreams a person keeps within himself, to a melody played by a lilting piano. And the overall impression you are left with is that everything which is included on the album is there for a very good reason. And there’s yet another track – “Volver Al Futuro” also includes the remix of “Estrellas” that was done by Fernando Picón and Delbys Márquez in 2011.. In the context of the album, the song works splendidly – which better way to end proceedings than listening to a different interpretation of its standout composition? The album was mixed by Guillermo Berta, and mastered by Felipe López at Ondaselecta Mastering (Colombia). Daniel Jacques (from Mandrake Wolf & Los Terapeutas) added bass to the songs “Arcoiris Digital” [Digital Rainbow] and “Popular”, whereas David Stabilto handled the mellifluous backing vocals that you can hear on “Estrellas”. The members of Les Enfants have been a part of the Montevideo underground scene for years. It’s clear that “Volver Al Futuro” brings together everything that’s ever happened to them, in one single place. A new band could never have created an album such as this one. There is experience, musicality, estheticism and a plethora of dreams that have been brought seamlessly into reality. And (above everything else), there is a great longing to enjoy what they’re doing – the kind of longing that only those who have aimed for something they deserved their whole lives could harbor. Veremos la tierra de lejos, será más entretenido.